Carmine's is a family style restaurant offering exceptional value to its guests through the many dishes of Southern Italian cuisine. The Carmine's concept is to bring its guests a "wow-factor" sized portions and making any meal feel like an Italian American wedding feast. Platters of homestyle antipasto, pasta, decadent seafood or meat entrees, and of course homemade desserts are all staples at Carmine's, meant for sharing amongst friends and family. When great food and wine are supported by friendly and knowledgeable service, the results are magic - we want every day to feel like a Sunday afternoon at Grandma's. Virgil's Real Barbecue has been acclaimed as one of America's top 10 BBQ restaurants. Established 1994, Virgil's meats are smoked at a low temperature over indirect heat for up to ten hours with a unique mix of hickory, oak and fruit woods in order to impart the most flavor. Aureole, New York is the flagship showcase for Charlie Palmer's unabashed, energetic signature Progressive American cuisine. Now under the culinary leadership of Executive Chef Gabriele Carpentieri, the kitchen turns out elegant, simple dishes with sharply focused flavors like Wagyu Beef Carpaccio with crispy shiitake, scallions, taro root, ponzu and lavash cracker. Aureole is located within the spectacular Bank of America Tower at One Bryant Park, the most environmentally advanced skyscraper in the world. Offering a range of dining options, the Liberty Room is smart and casual with walnut-topped tables and a back-lit, etched glass front bar with polished natural zinc top surface, the intimate Dining Room is designed in both lighting and texture to give off a golden glow, and The Halo Private Dining Room is wrapped with fabric panel and silver leaf walls, dotted with sculptural back-lit flame sconces. 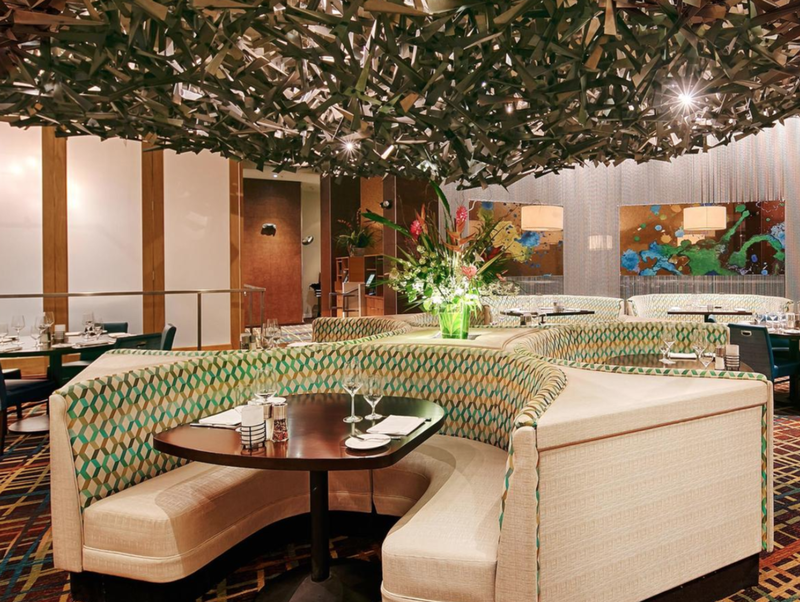 Now in its 29th year, Aureole is contemporary urban elegance. Times Square, Midtown Manhattan, New York City - the home to Broadway theatres and the biggest New Years Eve party in the world, is also home to the future stars of stage and screen at Ellen's Stardust Diner - THE home of the world famous singing waitstaff and some of the best diner food in the country. Serving Breakfast, Lunch and Dinner for tour groups and locals alike since 1987! Irish Bar and restaurant. Irish/American comfort food with a twist. Vegetarian and gluten free options available. Live music, DJs, Karaoke. Happy Hour seven days a week. Within the hallowed walls of the Time-Life Building, and surrounded by some of the city’s most heralded attractions from Broadway to Radio City Music Hall, the imminent arrival of The Capital Grille is creating quite a stir of its own. Especially anticipated are our legendary dry-aged steaks, fresh seafood offerings, and a widely heralded collection of over 7,000 bottles of wine. All presented with unparalleled service in an atmosphere of relaxed elegance that serves as a respite to the frenetic pace of the streets outside. Da Marino serves traditional authentic Italian cuisine featuring Chef Massimo's Northern Italian dishes and Chef Pasquale's Southern Italian cooking. Upon entering the restaurant you feel that you are in an old Italian villa overlooking the Mediterranean through balcony windows and terrace. The restaurant was created and designed by Chef Pasquale and painted by Italian artist Davide Rodoquino. We offer live piano music every evening.